Infiniti, which is Nissan?s upscale luxury division, first revealed it?s full size SUV at New York?s prestigious 2010 International Auto Show as a 2011 model under the QX nomenclature. It represented the second-iteration for their full size Adventure Tourer, which was designed to provide what Infiniti referred to as a genuine five-star travel experience. It became known as the QX56. The 56 designated the engine size. 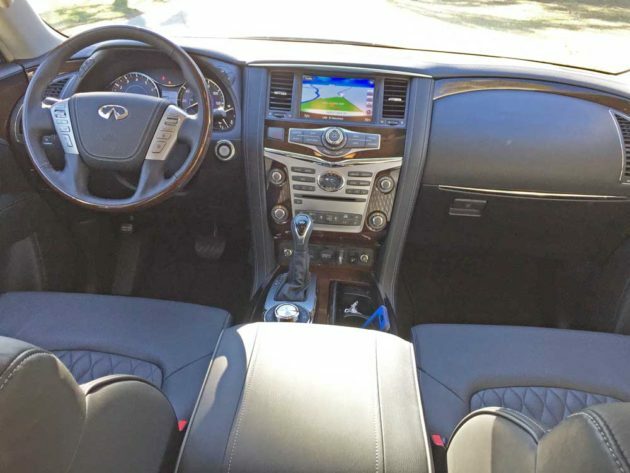 Enter the 2014 Infiniti QX80 ? the new numerical designation for the QX. The new QX80 continues to display a dramatic and dynamic presence, with styling cues that relate strongly to, and identify with the rest of the Infiniti vehicle lineup?s DNA. To be sure, it is not simply a dressed up Nissan Armada, but it is rather a sophisticated and superbly luxurious full size SUV, that delivers state-of-the-art technologies and features, ensuring the ultimate in heightened levels of luxury travel. 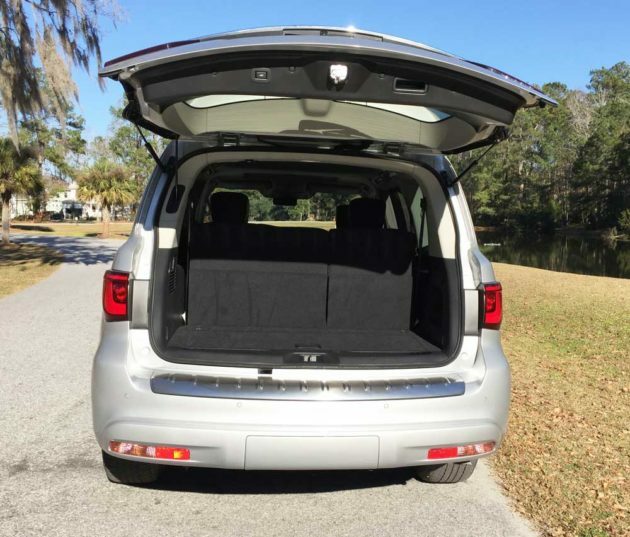 It serves up better than Business Class accommodations, and it is truly a First Class SUV that?s fully capable of transporting up to eight passengers and their gear in comfort. The QX is the way that Infiniti defines immersive luxury, with standards that provoke elevated emotional levels. The bold presence of the reworked QX80 starts at the front end with its new front fascia, prominent grille, flanked by low positioned, swept-back headlamps and domed, wave-like hood. The profile is unique, with the blacked out ?B? and ?C? pillars combining with the reverse ?kink? bright window surround emphasizing the generous greenhouse area. The rear view finishes with Infiniti?s dynamic rear glass, LED taillights, double-arch license plate housing and concealed tow hitch. Decorative side vents appear between the hood line and fender arch, just ahead of the front door?s leading edge. The driver?s side vent is functional, providing engine air intake. Other functional design elements include the front and rear spoilers that enable zero lift, aiding in improved handling stability and the specially shaped exterior mirrors that reduce wind noise. 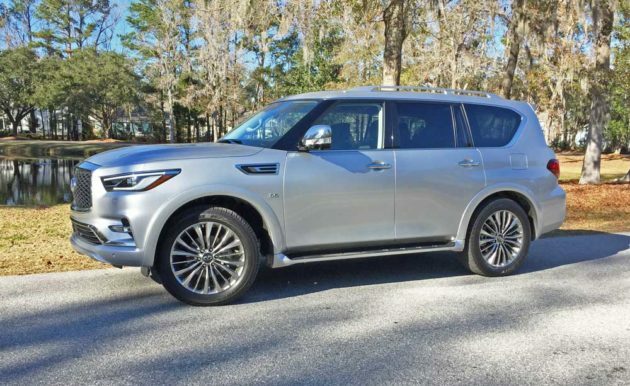 The built-in running boards and low roof rails, along with the standard 20-inch wheels and tires or optional 22-inch rolling stock that substantially fills the wheel wells all add to the athleticism of the QX80. 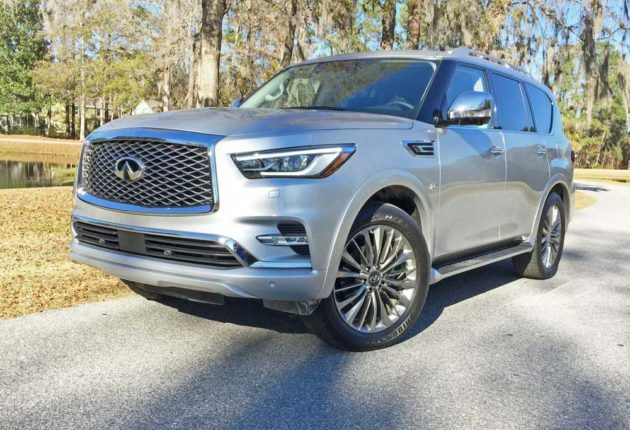 The inspired performance of the Infiniti QX80 is still provided courtesy of a 5.6-liter, DOHC, 32-valve V8 engine with VVEL and Direct Injection Gasoline that is shared with the Infiniti M series, but tuned specifically for the QX80. The engine produces 400 at 5,800 rpm, along with 413 pound feet of torque at 4,000 rpm. Despite high horsepower and torque output, the fuel economy is efficient, with city driving yielding 14-mpg, while highway travel registers an estimated 20-mpg. The engine couples to a 7-speed automatic transmission with driver Adaptive Shift Control, a manual shift mode and Downshift Rev matching. 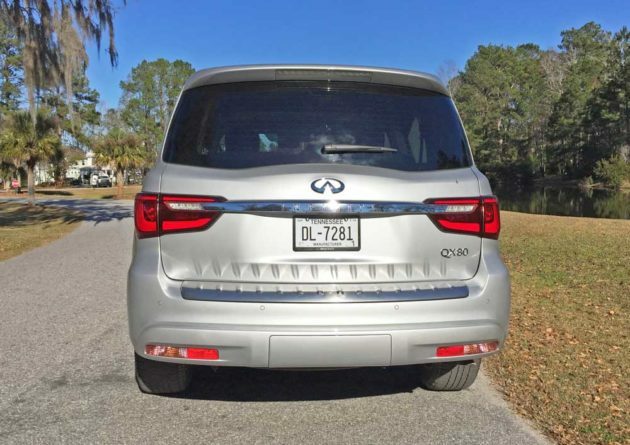 The 4WD system is Infiniti?s All-Mode 4WD, which in its automatic mode is rear-drive biased and continually adjusts power between front and rear wheels, delivering up to 100 percent in the rear and a maximum of 50 percent motive force up front. 4 High locks the center differential at 50:50 and is operational up to 60 mph. 4 Low locks the center diff in low range. Hill Start Assist prevents roll back on an incline for up to 2.5 seconds, while Snow Mode modulates the throttle for smooth starts under slippery conditions, Tow Mode automatically tailors gear changes to maximize engine torque when towing. A Tire Pressure inflation indicator activates the horn and flashes hazard signals when correct tire inflation has been reached. The available Hydraulic Body Motion Control System further reduces body lean during turning or cornering, as well as helping to minimize vehicle bouncing on rough road surfaces. More inspired technology includes: Hydraulic Body Motion Control; a Smart Rear View Mirror; the Around View Monitor with a 360-degree view around the QX80, making parking and towing exercises easier; Lane Departure Warning and Lane Departure Prevention systems; Intelligent Brake Assist with Forward Collision Warning; Intelligent Cruise Control with added Full-Speed Range; Distance Control Assist; and Blind Spot Warning System. Infiniti?s Hard Drive Navigation System includes: an 8.0-inch color touch-screen display; XM NavTraffic? and NavWeather? ; Zagat Survey? Restaurant Guide. The 2018 Infiniti QX80 2WD model is expected to account for 40 percent of QX sales with the remaining 60 percent being the 4WD version. Available options include: a Theater Package with dual 7-inch color monitors mounted in the first row seat backs with wireless headphones and 120V power outlet; a Split Bench Seat Package for the second row with 60/40 split folding (no charge); a Deluxe Touring Package with 22-inch, 9-spoke forged aluminum-alloy wheels, Hydraulic Body Motion Control System, Semi-analine leather seats, climate-controlled front seats and heated second row outboard seats, heated second row seats, Advanced Climate Control System and 4WD headlight washers; roof rails with cross bars illuminated sill kick plates; a Technology Package with Intelligent Cruise Control, Lane Departure Warning and Prevention, Distance Control Assist, Intelligent Brake Assist, Blind Spot Warning, Front Pre-Crash seatbelts and Adaptive Front Lighting System. 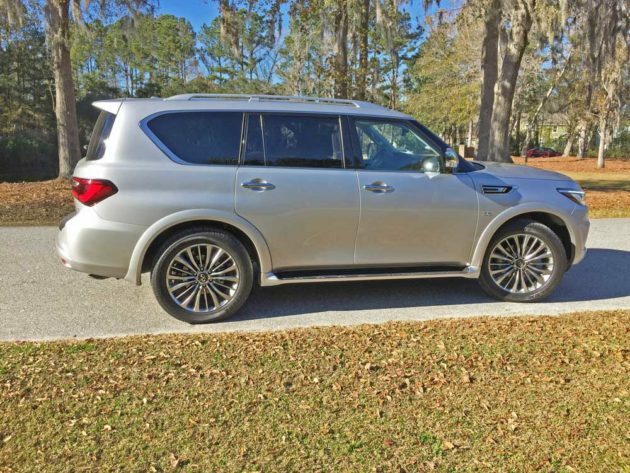 My test 2018 Infiniti QX80 was a 4WD model that was loaded with virtually all of the available options. The base sticker was set at $67,850. while the addition of optional features and equipment bumped the final total to $85,070. 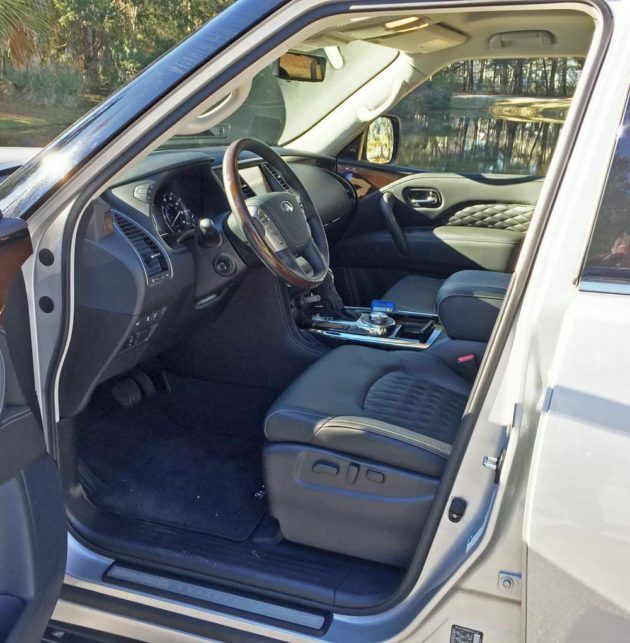 My test vehicle sported an exterior finished in Liquid Platinum metallic, with the interior executed in Graphite toned leather with polished wood trim accents on the steering wheel, center console and doors. Extra costs included: the Driver Assistance Package; Deluxe Technology Package; Theatre Package; 22-inch Wheel and Tire Package; split bench seat; roof rail cross bars; Infiniti WiFi; an All Season Package; Welcome Lighting feature; Premium Paint; and Destination and Handling charge. 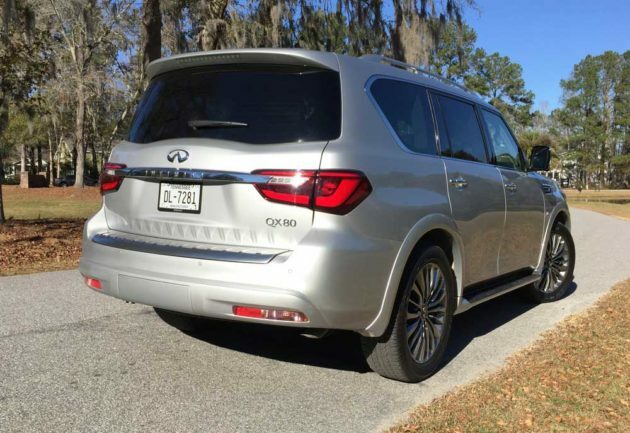 SUMMARY: The 2018 Infiniti QX80 showcases a distinctively elegant look ? especially for a vehicle of its mass. The lines are fluid and flow smoothly. Yes, it?s big and yes, it?s an SUV, a class that?s disdained by many, but it serves a definitive purpose ? to transport as many as eight occupants from point ?A? to point ?B? in sumptuous luxury and security. The interior is not unlike that of an executive jet. The acceleration isn?t as rapid as a personal jet, but it certainly more than answers the call, with sedan-like handling and stability. The QX80 stays flat under spirited maneuvering conditions on challenging roadways. The Premium Bose Sound System fills the cabin with superlative audio quality for those who are not appreciative of the pleasurable mechanical sounds served up by the vehicle itself. It allows the driver to customize settings, linking them to the Intelligent Key. The list of standard features and equipment seems never ending, and when one throws in the full complement of available bells and whistles, the content of this iteration QX borders on unbelievable. At the rate that Infiniti is progressing, it may not be long before the art of driving could all but disappear. On the plus side, much of the QX80?s technology may be switched off to enhance and restore the sheer pleasure of driving. 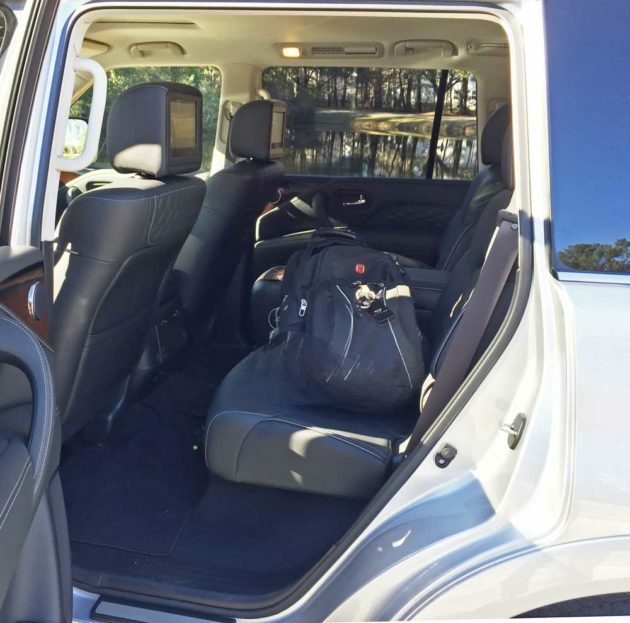 Bottom line, even for those who are not enamored with full size SUVs, the QX80 makes a sound case for the existence of such a vehicle, particularly for those who wish to travel in a heightened state of luxurious surroundings. Engine Type and Size: VK56VD 5.6-liter, DOHC, 32-valve V8 with VVEL and DIG. Transmission: Seven-speed automatic with Adaptive Shift Control and manual shift mode with Downshift Rev Matching. Drive Train: Longitudinally mounted front engine / Infiniti All-Mode? AWD with computer-controlled transfer case with Auto, 4H and 4L settings. Suspension: Front ? Double-wishbone with Dual Flow Path? twin tube shock absorbers, automatic rear self-leveling system and front stabilizer bar (on vehicles without Hydraulic Body Motion Control system). Rear – Double-wishbone with Dual Flow Path? twin tube shock absorbers, automatic rear self-leveling system and rear stabilizer bar (on vehicles without Hydraulic Body Motion Control system). Brakes: Power-assisted four-wheel vented discs with 4-wheel ABS, BA, EBD, VDC, and TCS. 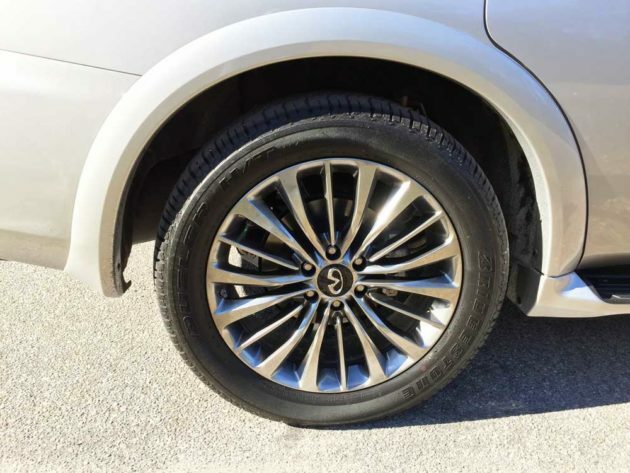 Tires: Bridgestone Dueler H/T 684II ? P275/50 R22 mounted on 6-?Tri-spoke? ? (18-spoke) alloy wheels. Height: 75.8 inches ? with roof rack.